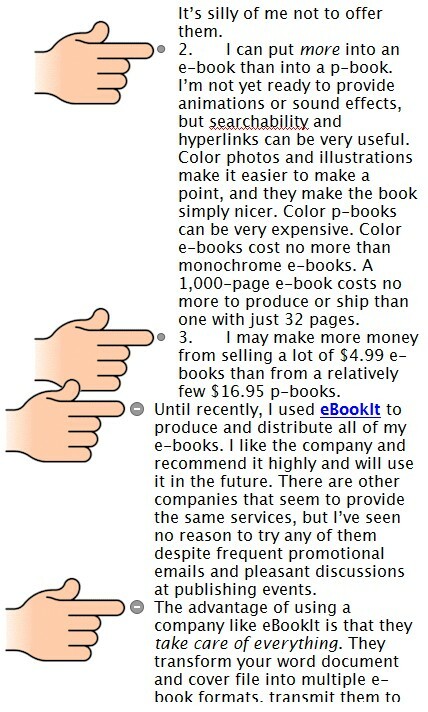 I was long aware of Kindle Direct Publishing, Amazon’s free entry into their e-book distribution system. I actually tried to use “KDP” (and Smashwords)—and failed. 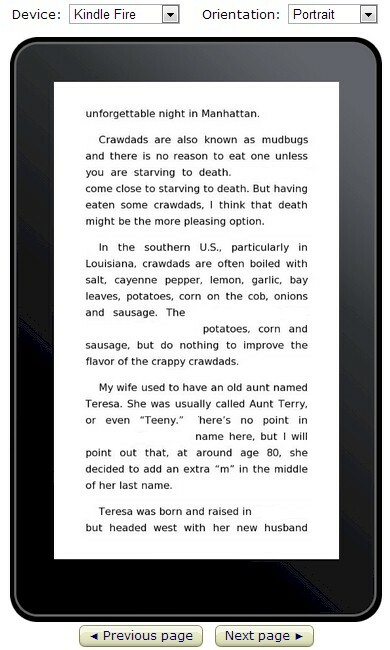 KDP is a free and relatively easy way to upload books for availability both on Kindle readers and competing devices like the iPad and Android phones and tablets with Kindle apps, and on computers. Books are uploaded as slightly modified Word documents. 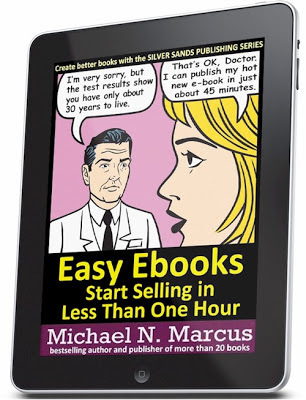 I’ve read several books about producing Kindle books to include on my Books For Authors review website.The publishing process made my mind numb, and I again decided to leave e-book formatting to the professionals. I am a geek, but an old-fashioned geek. I have obsolete skills. I can solder wires, develop film and tune-up an engine. In the 21st century I’ve formatted thousands of pages for printed books, and designed many covers. With this background, and my position as an avid proponent of independent self-publishing, I simply had to try to build a Kindle book one more time, despite the intimidating, mind-numbing documentation. 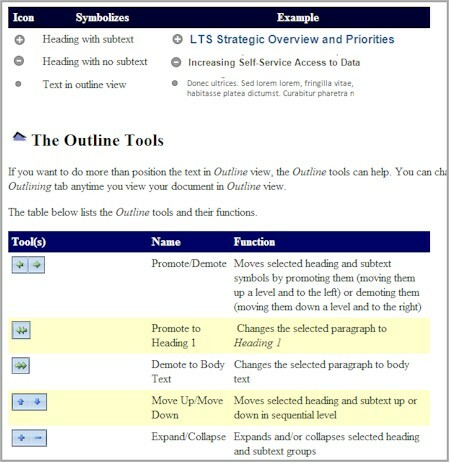 I was surprised and thrilled to discover that once you have a document produced in Microsoft Word, it takes just a few mouse clicks to make it available on Amazon.com. Before you do that clicking you have to produce a cover and probably change some of the formatting in your document, but it’s NO BIG DEAL. I first made many mistakes in uploading the proper files to Amazon, despite constantly referring to books and cheat sheets and calling Amazon. Now I can do it in a few seconds. Kindle books don’t always look the way you expect them to, so be prepared to make revisions before you announce them to the world. Also prepare to make compromises you would not settle for on printed pages. I like the ability to make change whenever I feel like it. I published nine Kindle books with KDP in a few weeks, and more are on the way. It’s easier than installing a sink or removing a car’s water pump. Each book gets easier, and I've even published a Kindle book to tell you what I've learned. Nothing is perfect, however. I've encountered a few bits of KDP weirdness that I should tell you about. After uploading your interior file, Amazon offers a nifty previewer that lets you view your book on a simulated Kindle e-reader. You can switch from portrait to horizontal views, and also view other simulated reading devices such as iPad and iPhone. [above] However, the preview may show some strange white blotches where text should be. I don't know why this happens, and the text gaps on the previews don't happen in the real e-books. The other problem is equally disconcerting, and may be more damaging. [above] The online preview on Amazon.com may show oversize type and even wrong color type. I've found this in three of my books. Strangely, the actual downloaded books are fine (at least as I've viewed them). 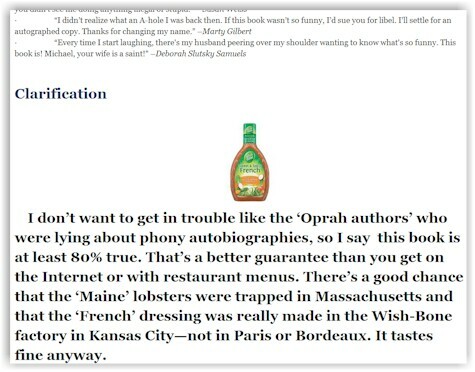 However, a crappy preview may stop people from ordering your book, so it's important to fix the preview. 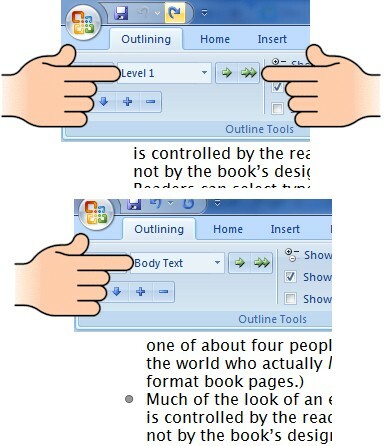 [above] The secret to making the repair is in the Outline view in Microsoft Word. The circular symbols to the left of your text actually mean something, and should not be ignored. [above] This handy cheat sheet from the University of Wisconsin explains the symbols and what you can do about them. Simply highlight a paragraph that's to the right of a plus or minus symbol within a circle (indicating that it will be displayed as a header instead of normal text), then click on the double-right-arrow symbol at the top of your screen to change from a header to Body Text and save your file and upload again. This procedure may take a long time with a big book, but it's worth the effort. Now I'm going to add this material to my book, and go back to bed. Thanks for the important tip. I would never have looked in the outline view. very encouraging... much thanks. Patience. Related to the online preview issues - Can you please send the following details to kindle-publishing-tools@amazon.com to help us troubleshoot? -> Issue Pointers: Which chapter/section you see this issue? eAthena Solutions offers services for Word to Kindle conversion,kindle format ... from Mobipocket/Kindle amazon kindle ebook conversion formatting to conversion to publishing companies.